Aruna Roy (born 26 May 1946) is an Indian political and social activist who founded and heads the Mazdoor Kisan Shakti Sangathana (“Workers and Peasants Strength Union”).Aruna Roy is best known as a prominent leader of the Right to Information movement, which led to the enactment of the Right to Information Act in 2005. She has also remained a member of the National Advisory Council.In 2000, Aruna Roy received the Ramon Magsaysay Award for Community Leadership. 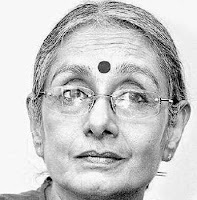 In 2010 she received the prestigious Lal Bahadur Shastri National Award for Excellence in Public Administration, Academia and Management.Aruna Roy was born in Chennai in a Tamilian family to Elupai Doraiswami Jayaram and Hema. She is the eldest of four children and has two sisters and a brother. Her father, who was a lawyer, joined the civil services and eventually retired as legal adviser to the Council of Scientific and Industrial Research. Aruna had an unusual and disjointed schooling. For her primary education she was sent to the Convent of Jesus and Mary in New Delhi. She was then sent to Kalakshetra cultural academy in Adyar, Chennai, where she learned art, the Bharata Natyam style of classical dance and Carnatic classical music for two years.This was immediately followed by an year spent at a school at the Aurobindo Ashram, a spiritual commune located in Pondicherry, India. Finally, she attended a Bharatiya Vidya Bhavan school in New Delhi, where she finally completed her schooling. Aruna graduated in English from Indraprastha College for Women in 1965 and joined the University of Delhi for post-graduate studies. She spent one year teaching at Indraprastha College, during which period she passed the Indian Administrative Services ( IAS ) examinations in 1967.One of her classmates during post-graduate studies at Delhi university was Sanjit Roy, another left-wing social activist, whom she married in 1970. Before being wed, Sanjit and Aruna agreed on various conditions that would govern their married life. Although their demanding individual schedules makes it difficult for them to spend a lot of time together, and contrary to perceptions held by some, Sanjit and Aruna are not separated.Aruna served as a civil servant in the Indian Administrative Service between 1968 and 1974. She then resigned to devote her time to social and political campaigns.Aruna Roy joined the Social Work and Research Center (SWRC) in Tilonia, Rajasthan, founded by her husband, Sanjit Roy. In 1983 Aruna dissociated herself from the SWRC. While working at the SWRC, Aruna had met Shanker Singh, an activist and theatre artist who uses street theatre, puppetry, song and drama to convey complex leftist ideologies to rural audiences in an idiom familiar to them. In 1987, Aruna and Shankar Singh, with a few associates, moved to Devdoongri, a village in the Rajsamand district of Rajasthan where many of Shankar’s relatives live.Here in 1990, they set up the Mazdoor Kisan Shakti Sangathan ( “Workers and Peasants Strength Union” ) an organization that they described as a “non-party people’s organisation”. The MKSS has operated out of Shankar’s cousin’s house in Devdoongri since its inception. In the mid-1990s, under her guidance, the MKSS began a campaign that advocated the public’s right to scrutinize official records, a crucial check against arbitrary governance. The MKSS attacked corruption at the grassroots level and sought accountability of public officials in matters related to disbursement of government funds.The fact that the MKSS was founded and led by a a woman activist, namely Aruna, commended the organization and its cause to the favour of Sonia Gandhi. Aruna leveraged this advantage further by ingenuously linking the Right to Information with issues related to womens’ employment, livelihood and empowerment.With Sonia Gandhi’s support, the Congress-led government of Rajasthan passed the Rajasthan Right to Information Bill in 2000. Rajasthan, never otherwise noted for its progressive outlook, passed such a legislation, and Aruna received the Ramon Magsaysay Award for Community Leadership the same year. Aruna decided to use the award money of US $ 50,000 to set up a trust to support the process of democratic struggles.In 2004, under the leadership of Sonia Gandhi, the Congress party won the national elections and formed the central government. Aruna was inducted into the National Advisory Committee ( NAC ), an extremely powerful but extra-constitutional quasi-governmental body headed by Sonia Gandhi which effectively supervises the working of the Manmohan Singh-led government. Aruna’s role was to formulate the Right to Information Act which was passed by the Indian parliament in 2005. She served as a member of the National Advisory Council of India until 2006 and is part of NAC II. In 2005, various women’s organizations launched a campaign aimed at ensuring that a woman received the Nobel prize for peace. They drew up a list of 1000 women from 150 countries who they claimed were worthy of being considered for the honour. Aruna was one among these 1000 women.